How Can I Go to School While in the Air Force? Of course, everyone who enlists on active duty is eligible for the G.I. Bill. Unlike the Army and Navy, the Air Force does not have a "college fund" which adds money to your monthly G.I. Bill entitlements. Like all of the services, in addition to the G.I. Bill, the Air Force also gives tuition assistance for college courses you take when off-duty. Like all of the services, when you are off-duty, you can take college courses on campuses close to the military base you are assigned to or take advantage of courses offered on-base through the base education offices. Courses offered on-base are by actual colleges and universities, which are considered "military friendly," in that they generally give credit for military training and usually have liberal credit transfer policies. In addition to degree programs offered by the "military friendly" colleges and universities that operate on and around military bases, you can receive a fully accredited Associates degree from the Air Force itself. The Air Force has established the Community College of the Air Force (CCAF). 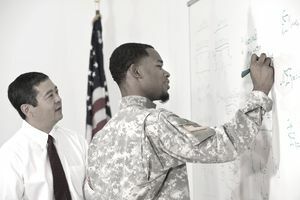 The college is one of several federally chartered degree-granting institutions; however, it is the only two-year institution exclusively serving enlisted personnel. The college awards the associate in applied science degree after a student successfully completes a degree program designed for an Air Force specialty. The Community College of the Air Force is accredited through Air University by the Commission on Colleges of the Southern Association of Colleges and Schools to award the associate degree.